This session runs for 30 minutes with a maximum of 5 children per class. The teaching of swimming and survival techniques is a priority for this age group. We endeavour to ensure your child is placed in an age and ability appropriate class. We teach to the needs of the individual child, and role models in a class is an important factor in the learning process. Our aim is firstly to develop confidence and independence. This is acheived by teaching the elementary survival stroke of dog paddle, a stroke which children can learn before breath control is mastered. 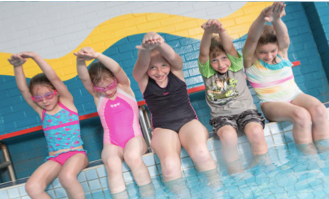 Once dog paddle has been mastered, children are introduced to freestyle and backstroke with strong emphasis on breath control, correct body position and stroke technique, appropriate to the child's physical and psychological development. Breaststroke is introduced when the children show readiness to cope with a new technique. As pupils become proficient in these strokes they are promoted to more advanced classes where the focus is on stroke improvement, streamlining and stamina building. Our qualified teachers are in the water at all times during lessons.